On the 20th November, I’m scheduled to be flown in a Twin Otter from the Antarctic Logistics and Expeditions (ALE) base at Union Glacier to the start point, which should be about 82’ 27S, 65’0W, a point on the coast line, off the Weddell Sea, where the Filchner / Ronne Ice shelf attaches to the Antarctic continent. 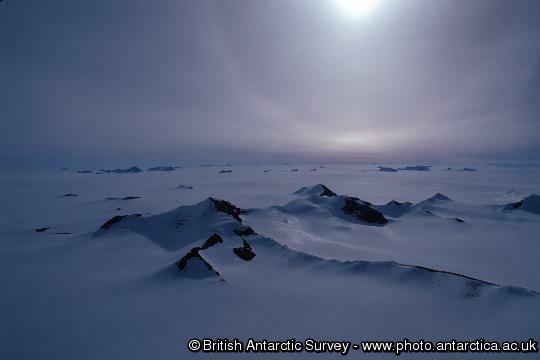 The elevation here is about 140 metres above mean sea level, and it is about 6-700 kilometres from the edge of the sea ice shelf in the Weddell Sea. Just to the east of the starting point the huge Foundation Ice Stream flows from the Pensacola Mountains, some 150 miles into the Ronne Ice Shelf. Ice streams are channelized glaciers that flow more rapidly than the surrounding body of ice. The interface areas between the more rapidly flowing ice stream and the slower moving lateral ice, are potentially dangerous crevasse filled terrain. Although they account for only 10% of the volume of the ice sheet, ice streams are sizable features, up to 50km wide, 2000m thick and hundreds of km long. Some flow at speeds of over 1000m per year and most of the ice leaving the ice sheet passes though them. The Foundation Ice Stream is one of about 6-10 ice outflow points that facilitate the removal of ice from the Antarctic Plateau ice sheet. 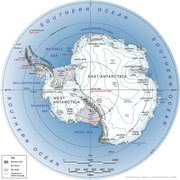 NASA have recently provided this fascinating video ( http://www.huffingtonpost.com/2011/08/21/antarctica-ice-flow-map_n_932467.html ) that shows how the ice flows off the continent of Antarctica. From the start my route will take a slightly westerly direction off the direct route to the Pole, away from the Pensacola mountains, on a compass course of around 185 degrees. This to enable me to avoid the crevasse described above, associated with the Foundation Ice Stream interfaces. I’ll be climbing in elevation on average of about 200 metres a day. 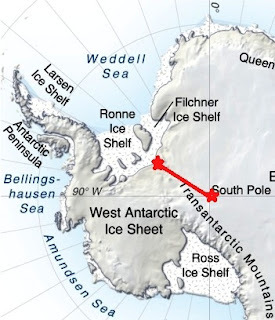 Around 84’30S I plan to head a bit more south, but still west of the rhumb line course to The Pole, with a view to avoiding a large crevasse field around 87’0S. The Thiel mountains will be on my right, although covered in ice but hopefully I’ll get a view of a number of nunataks. Once around the crevasse field, I’ll more or less be up on the Polar Plateau, and most of the elevation climbing would have been done, and hopefully without any mishaps. From there it will then be a final ‘drag’ to the South Pole, and the Scott Amundsen Base of the USA. I will definitely not arrive in time for the huge Amundsen centenary celebrations on the 14th of December, but somehow I know I will have my own 'huge' party should I make it! Hey Howard looking forward to traveling with you on this one. From my 1st camp on the ice! This time we are really leaving! Touch down on Antarctica: and a perfect day! Second flight just left....WE are next up! Solo but not Alone…..How does that work?? ?